I trained to be a school teacher in the 1960s, when many people thought that the world could be changed for the better. Our student idealism was reinforced by studying the poetry of the Romantics, the philosophy of Jean-Jacques Rousseau and John Stuart Mill, the novels of D.H. Lawrence, the child development theories of Susan Isaacs and Jean Piaget, along with the anarchist proposition that play and freedom were the same thing. We watched films such as François Truffaut’s Les Quatre Cent Coups, and were encouraged to believe – and many did – that childhood was a state of grace. These ideals were reinforced by what was happening in architecture at the time – Aldo van Eyck’s revolutionary 1961 orphanage in Amsterdam turned the world of institutional childcare upside down, as did his post-war programme of creating 700 playgrounds in that one city alone – and this new spirit of the age was captured and amplified by a new bravura in architectural photography. John Pantlin’s photograph was first published in 1950 in The Architects’ Journal, and records a view of Aboyne Lodge Infants School in St Albans. It was soon to become an icon for the optimistic world of British post-war school architecture, particularly for the architects’ department at Hertfordshire County Council, whose design it was. The county’s then Chief Education Officer, John Newsom (who went on to become a national figure in British education), realised that good publicity could only help further the county’s ambitious school-building programme, and cultivated the architectural press assiduously. As a result, the photographer chosen to document the school, John Pantlin, was someone whose work was already admired for its sharp, sunlit images of a new world in the making, and in this photograph he captured everything Newsom and his colleagues wanted. The image became popularly known as The School in the Orchard, since the new pavilion-style school had been built in the grounds of a former market garden. Pantlin took advantage of the location to construct an elaborate idyll of a new Eden. Photographed in spring, the apple trees in blossom provide a perfect proscenium arch for what at first sight appears to be a theatrical tableau. But the image is rather more complicated than that, and its construction and effects more far-reaching, since it directly challenged many established conventions associated with architectural photography. For a start the building itself is relegated to the background, and the viewer soon realises that through Pantlin’s lens it is not the building which is being celebrated, but the building’s social and historical ‘moment’. The ‘decisive moment’ on this occasion is not an existential fragment of time, but a historical moment, when more radical ways of thinking about the world seemed possible. The photograph thus opens a new door in social time. Furthermore, most new architecture is photographed and published as pristine, uninhabited space, isolated from its immediate surroundings or milieu. But not here, where the building’s users are centre-stage, and artful design has constructed a setting evocative of the dawn of creation. By contrast, when Alison and Peter Smithson designed Hunstanton Secondary School in Norfolk, four years after Aboyne Lodge, they notoriously stipulated that it was to be photographed without any equipment or furniture – and certainly no children – so that the images would present a series of machine-precision Euclidian voids, privileging the design and the materials used (thus earning a place in the modernist canon), rather than its potential as an environment which supported learning and pastoral care. 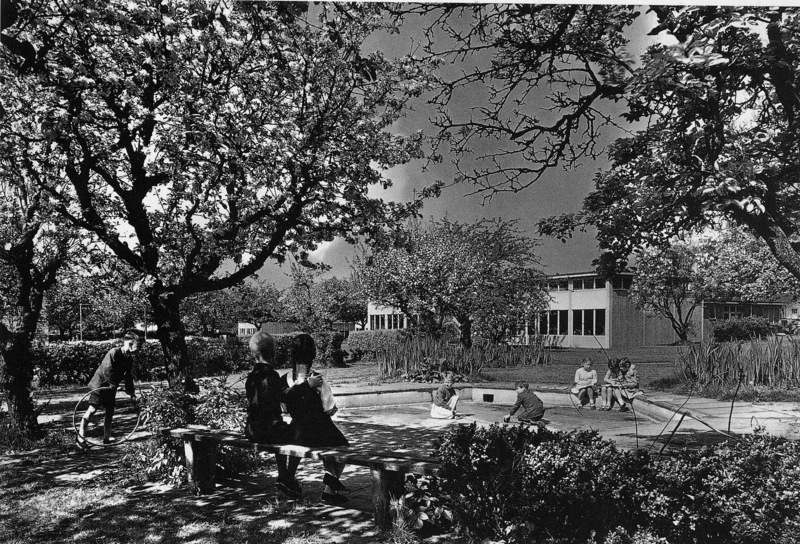 If The School in the Orchard is not an architectural photograph, then is it political propaganda, one of those images which consciously symbolises the virtues of a new regime or social order? People had got used to seeing such photographs featuring the eager faces of young people in Soviet or Nazi propaganda, which used such imagery tirelessly, though after the war this genre became discredited, only to be replaced by a new trope – those of children at play amongst ruins or slum streets – where a more tentative ambition was suggested. Such images came to prominence in Edward Steichen’s seminal 1955 New York exhibition, The Family of Man, an exhibition whose aesthetic was that of self-styled ‘documentary humanism’. Photographs of street children, or children at play – often face to camera – were meant to suggest resilience in the face of adversity, or the universal inclination of children everywhere to play and create worlds of make-believe, however harsh the circumstances. The closing photograph of that exhibition was W. Eugene Smith’s 1946 portrait of his own two children walking hand in hand through a sunlit wood, called The Walk to the Paradise Garden, to which Pantlin’s photograph might be regarded as a sequel, though we cannot be sure Pantlin had seen it when he took his photograph. Yet The School in the Orchard challenges these conventions too. Its principal subjects, a boy and a girl, possibly brother and sister, are photographed with their backs to us, seemingly lost in thought or engaged in a private conversation which we can never know or presume to know. Both are sitting on a bench, on the edge of a circular sunken play area, the fair-haired boy’s arm protectively around the shoulder of his dark-haired companion. The other children in the photograph are likewise absorbed, including the boy with a hoop who seems to have been borrowed from a painting by Poussin, and none of them either can in any way be interpreted as avatars of a new ideological order. In this period school architecture was required to focus as much on promoting health as it was on pedagogy. As architectural historians Catherine Burke and Ian Grosvenor wrote in their survey, School (2008): ‘If one were asked to identify an iconic school building of the first half of the twentieth century, it would be very easy to single out the ‘First Open Air School for Sick Children’ in Amsterdam designed by Johannes Duiker and Bernard Bijvoet in 1929-30.’ This is an extraordinary building which my wife and I have also studied and photographed, the design of which owes much to the development of pavilion architecture, whose origins are often credited to Florence Nightingale. It was Nightingale’s insight into the recuperative effects of the circulation of air and access to sunlight, which resulted in a new style of hospital ward, with large opening windows on both sides, and with balconies and garden terraces along one flank, where beds could be moved out into the open whenever possible. In response to the scourge of TB, the Victorian pavilion ward was adapted and modernised as a sanatorium pavilion, and out of the sanatorium pavilion emerged the architecture of the modern primary school. When the project architect for Aboyne Lodge, Donald Barron, set to work in 1949, he was still required to design a building in which each classroom ‘required no less than six complete air-changes every hour’. The long glazed facade we see in the photograph could easily have been that of sanatorium, with easy access to the surrounding gardens, and in recent years this pavilion style has been further modified and updated to create the modern hospice. My own childhood included two long stays in hospital, one as a result of a street accident, and the other requiring a period in an isolation hospital after being diagnosed with ‘scarlet fever’. I rarely revisit my past, but I can now see how the world of the hospital ward became a place where reveries of ‘life outside’ affected me deeply, and to which I have ever since been committed personally and politically. I am only interested in architecture which connects to the world beyond, whether street, garden, park or city. Ken Worpole has written widely on architecture, landscape and public policy, and has collaborated with photographer Jason Orton on two books on the English landscape: 350 Miles (2005) and The New English Landscape (2013). Posted on July 3, 2015 December 8, 2016 by vsmallfires	This entry was tagged Aldo van Eyck, Edward Steichen, Francois Truffaut, John Pantlin. Bookmark the permalink.